With the introduction of PrimeSurface® 96 Slit-well Plate, media exchange for 96 well plates can be efficiently handled with one step dispensing or aspiration for all 96 wells decreasing the pipetting time by over 80% while minimizing the risk of spheroid damage. A new design of ultra-low attachment 3D plate to facilitate easy handling of media exchange without disrupting spheroid formation. 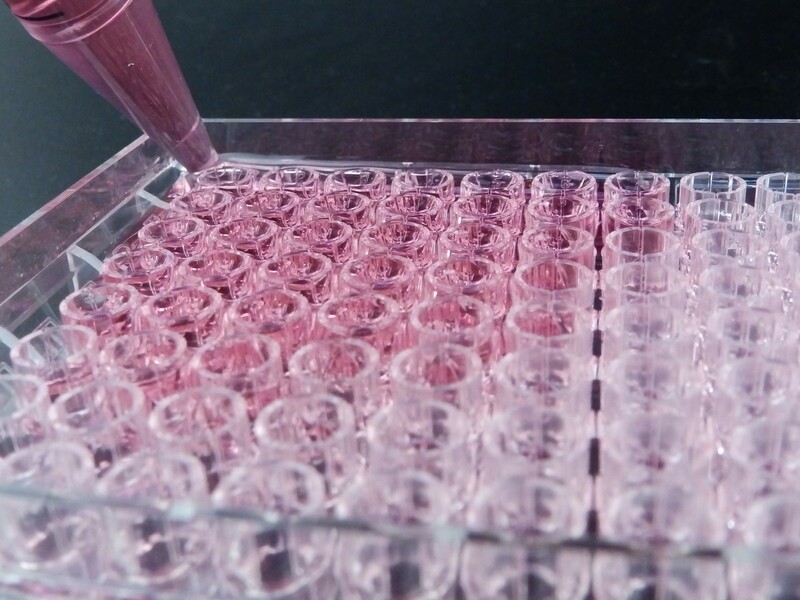 Minimize media exchange time by simultaneous delivery of cell culture media to all 96 wells. 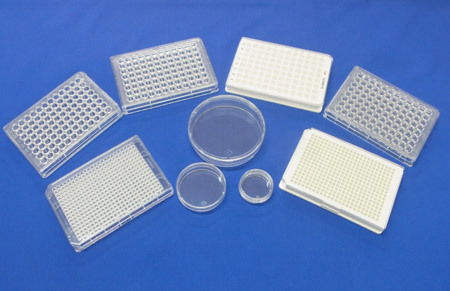 Cell culturing involves frequent media replacement to provide nutrition to growing cells. In a standard 96 well ultra low cell attachment plate, media aspiration or dispensing has to be done extremely carefully to avoid disturbing the unattached spheroid, making this a time consuming operation. With the introduction of PrimeSurface® 96 Slit Well Plate, media exchange for 96 well plates can be efficiently handled with one step dispensing or aspiration for all 96 wells decreasing the pipetting time by over 80% while minimizing the risk of spheroid damage. This instruction explains the basic operating procedure for PrimeSurface® 96 Slit-well Plate. Instructions recommended here are the best operating protocols but depending upon your cell line and assay, some optimizations may be required. The product and instruction are subject to change. 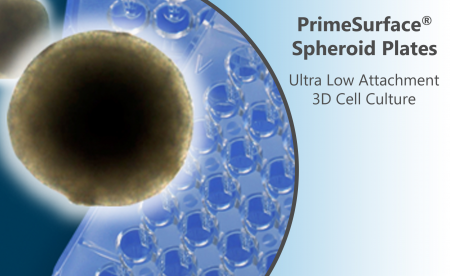 PrimeSurface® 96 Slit-well Plate, is designed to form and maintain uniform spheroid for long term cultures. New and innovative design of plate with slits on the upper half of each well. Media aspirating and dispensing is efficiently performed from the corners of the plate while keeping the spheroid formation undisturbed in wells. Figures below are schematic for explaining the use of PrimeSurface® 96 Slit-well Plate in spheroid formation and media exchange. Procedures of cell spheroid formation (Figs. 1-3) is described in detail on page 2. Procedure for exchanging culture media (Fig. 4) is described on page 2. Open the packaging of a new Slit-well Plate under the hood. Seed cells in the plate at a density of 6,000-9,000 cells/100 μL/well. -The recommended volume of the above cell suspension is approximately 100 μL. -As the maximum capacity of each well is 100 μL, do not exceed 100 μL volume for cell suspension per well. -The formed spheroids are apt to slip through the slit or protrude outside the well if the number of seeded cells is insufficient. -Dispense the cell suspension at the bottom of each well (section b). (Do not dispense it in section a of the well, i.e. in the slit section). Culture the cells in the incubator. -After every 24-48 hrs, check for spheroid formation. Gently and carefully handle the plate during this first 24-48 hrs, as the spheroids being formed in the initial stage are fragile and can break apart. 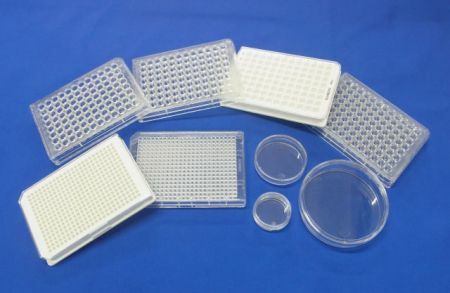 Dispense fresh culture media (20 mL per plate) at the corner of the plate using the 25 mL pipette. -The total volume of the dispensed culture media is 30 mL per plate, i.e. an aliquot of 10 mL during cell seeding, plus 20mL in this step (as stated above). -Maximum capacity of the plate is 40 mL/plate. -Dispense media slowly (should take about 20 seconds to dispense 20 mL volume to the plate). Place the plate in the incubator. Aspirate the media from a corner of the plate with a 25 mL pipette and dispose of it. -Apply the pipette tip to the corner of the plate and gently aspirate the old culture media while slightly tilting the plate. -The plate must be tilted in order to properly aspirate the culture media. -The recommended aspirating volume is 15 to 20 mL (takes about 20 seconds). -Note that the capacity of the slit plate is 40 mL/plate. It is advised to stay with total volume of 30 mL/plate. -Dispense media slowly (takes 20 sec) to avoid any overflow. plate have been evenly covered with media.